Fortunately, we are able to correct Nelson Rockefeller's errors using US Census reports and studies by state and local agencies. For example, county health statistics published in a Council of Community Services report by sociologist Paul Wheeler showed that in 1960, infant mortality in Albany's South End was in line with the city average. This map of population losses and gains based on 1950 and 1960 Census enumerations was published by the Council of Community Services in "Population Patterns: City of Albany and Albany County" (1961). The same report made clear that since 1950 the area's population had undergone "rapid change." White adults (ages 20-64) were leaving the area in droves. Some moved to the edges of the city, others to the suburbs. An influx of black families could not make up for this loss. During the 1950s, the population of Albany's South End, including the 98 acres, had become older, poorer, blacker, and significantly smaller. An understanding of population and housing characteristics is important for assessing what the city of Albany lost in 1962--and who was most affected. This has significance beyond Albany, as every city in the Northeast and Midwest underwent massive urban renewal projects and experienced similar population disruptions. The area in and around the 98 acres had long been home to immigrants. The Roman Catholic Diocese placed three national parishes in and near the 98 acres. Holy Cross (German), on the corner of Hamilton and Philip streets, was founded in 1850 and relocated to Western and Brevator in 1959. A Knickerbocker News article from January 1960 noted that "the parish population was depleted as ... families moved to residential sections uptown." Assumption (French) at 109 Hamilton would likely have endured the same fate. The parish celebrated only four baptisms and one marriage in 1961. St. Anthony (Italian), on the corner of Madison and Grand (the building now houses the Grand Street Community Arts), was the largest and most vibrant of the three national parishes, but even it was in decline. Between 1956 and 1961, baptisms dropped from 112 to 86 and marriages from 39 to 30. By contrast, St. Sophia's Greek Orthodox Church, on Lancaster between Eagle and High, was in the midst of a major expansion campaign. Likewise, the predominantly black Wilborn Temple was growing and had recently purchased the former Beth Emeth synagogue on S. Swan between Lancaster and Jay. 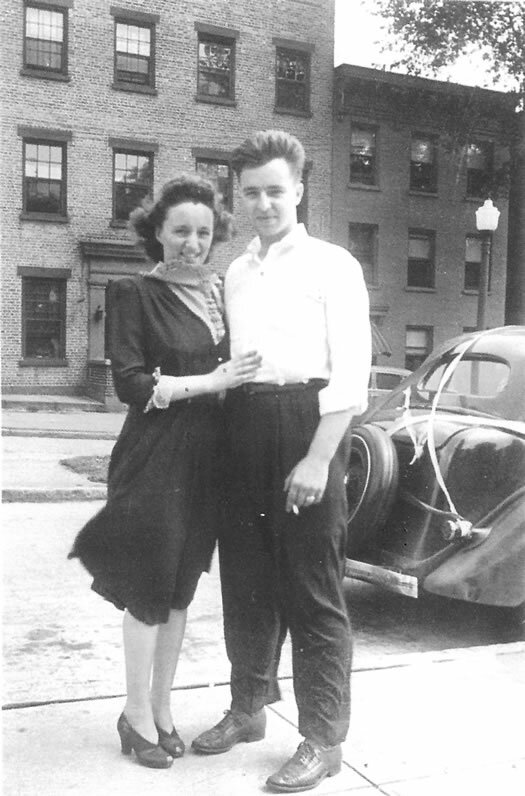 Jim Leonard, a third-generation Irish South Ender, and his future wife, Emma Michela, a second-generation Italian from Philip Street, ca. 1942. Jim and Emma lived with their four children at 93 Park Avenue before the South Mall. Courtesy Mark Leonard. Here's more of their story. Since the late 19th century, Italian immigrants had made their homes and built businesses in and near the 98 acres. By 1960, their numbers had declined. However, at about 13 percent of the population in the relevant Census tracts, first- and second-generation Italian-Americans were the second largest ethnic group in the area. African-Americans -- some born in Albany, others migrants -- were an even larger (18 percent) and growing population. Using block-level data, we've found that about 10 percent of households in the take area were non-white. Taking the average size of black households into account, we estimate the African-American population within the 98 acres to have been roughly 14 percent. James C. Strawn was a janitor, musician (leader of Jimmy Strawn and His Sultans), and off-the-books barber, who once lived and worked at 29 Grand Street. He moved into what would become the South Mall area soon after the end of World War II. In March 27, 1962 (the day the State appropriation was announced), Mr. Strawn told a Knickerbocker News reporter that he hoped that "tearing down 'these 50- and 60-year-old buildings might make for some decent places in which to live.'" Renters made up nearly seven-eighths of the households in the take area, though rates of homeownership varied from block to block. (For reference, 40 percent of the city's households owned their residences at the time.) One reason for this high proportion of renters was that the area was densely built, and many former single-family homes had been converted into rooming houses or apartments. Another reason was redlining, which made mortgages and home improvement loans costly or unavailable in neighborhoods banks considered risky. This disinvestment led to a deterioration of housing stock and a trend toward absentee ownership. As a result, South Mall-area housing was among the most dilapidated in the city, and home values were low. But there were exceptions to this general trend. For example, Sarah Stapleton's State Street home and the Leonard family house on Park Avenue were both appraised at more than $20,000, well above the city median value of $14,800. This table uses block-level data from the 1960 census. 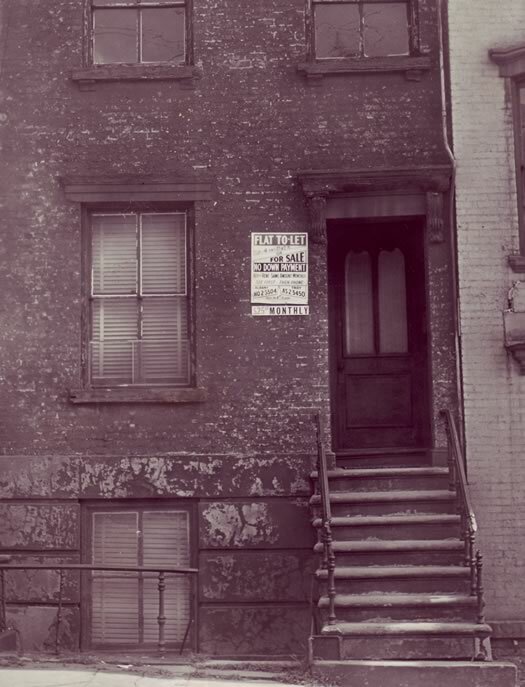 This property at 35 Jefferson was once owned by Sidney Albert and Irving Kirsch, notorious for the poor condition of their rental properties and a dubious rent-to-own scheme that was later exposed by William Kennedy in the Times Union. 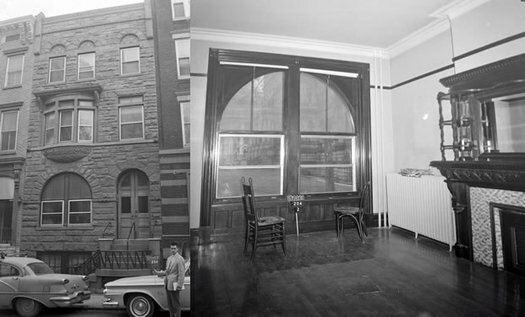 In 1961, this house was photographed for the Knickerbocker News as an example of "substandard housing." Courtesy Times Union. The area between Lancaster and Hamilton streets was the city's rooming house district. It was home to a large population of single men, many of them elderly and poor. Housing these men was a business dominated by women, most famously Mae Carlson and Lillian Pierce. Cheap hotels, including Frank and Assunta Palombi's on Green Street, also catered to this group. 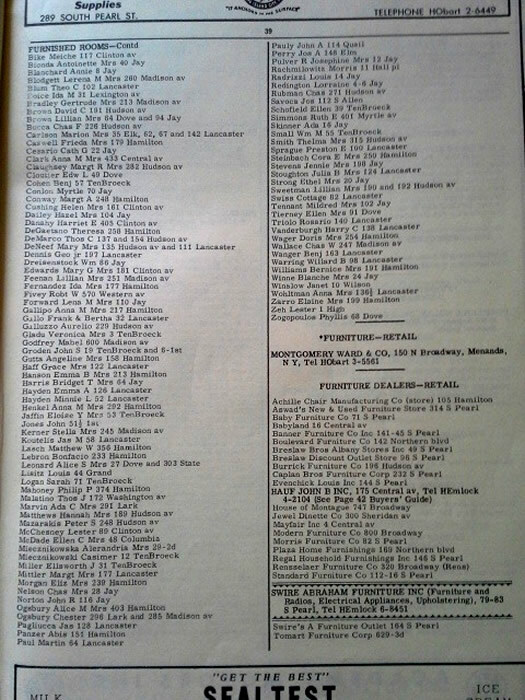 This page from the 1962 city directory lists the addresses of Albany's rooming houses. A March 1963 count of the remaining South Mall-area residents estimated that there were about 1,025 single men living in the area. This group represented about one third of all households and at least 15 percent of the area's population. 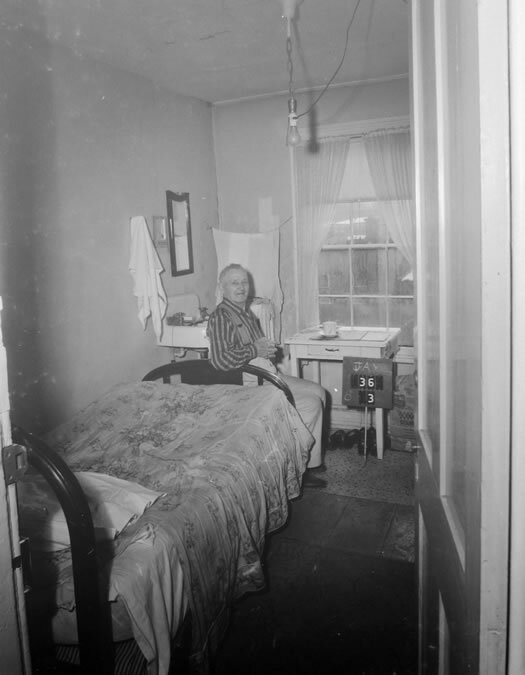 The local Tuberculosis Association was particularly concerned about the fate of this group of single men, fearing that the destruction of furnished single-room residences would lead to rising homelessness and deteriorating health. A related fear, according to the Council of Community Services, was that displacement of these men would serve to "push the slums into another section of the city." 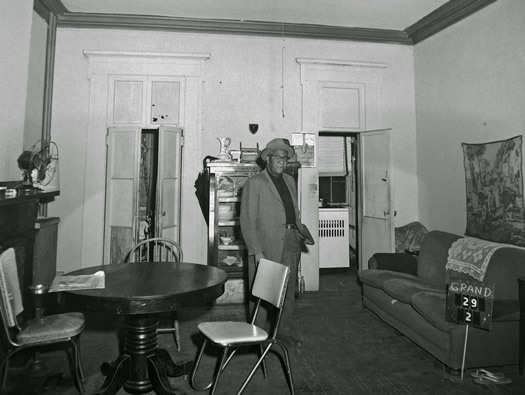 Like many other rooming house residents, this unidentified man lived in a room on Jay Street. He probably shared a bathroom with the building's other tenants and took his meals at the lunchrooms and taverns on Hudson Avenue. These former residents have proved to be the hardest to track and the easiest to overlook. One goal of the 98 Acres in Albany project is to identify every person who once lived in the South Mall area and to place them back in their former homes, because only then will we know the true impact of this massive urban renewal project. One weakness of the available data is that it does not tell us what happened to former South Mall-area residents after they lost their homes. We are trying to locate the records of the New York State Department of Housing and Community Renewal's (DHCR) South Mall office, including both data from the March 1963 survey and copies of the forms residents were required to fill in order to receive reimbursement for moving expenses. Wish us luck with our FOIL requests! Our research relies heavily on US Census reports on population and housing. 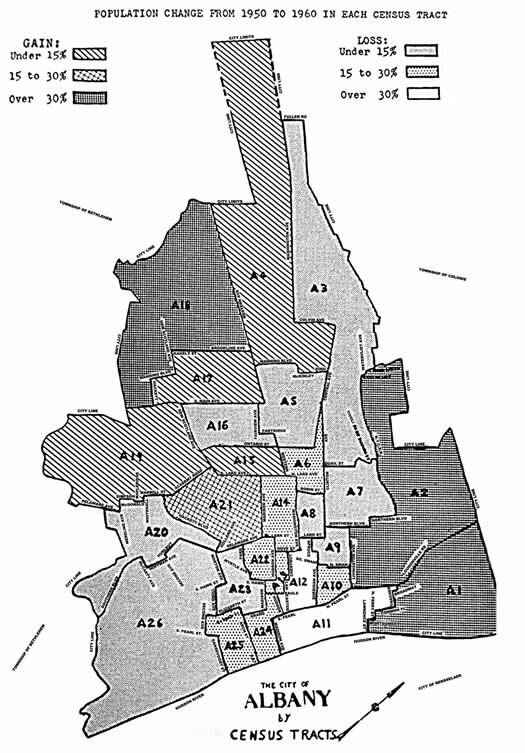 The 1960 "City Blocks" report counted 7,066 persons living in the 98 acres. By 1962, given the downward trend in the area's population, that number was probably lower. Sacramental statistics are available from the archives of the Roman Catholic Diocese of Albany. We are happy to share PDF copies of the Council of Community Service's 1961 report on Albany "South East Quarter" by Paul Wheeler and the results of the March 1963 "South Mall Survey" by DHCR. Just email us: 98AcresinAlbany |at| gmail |dot| com. Ann Pfau and David Hochfelder are members of the 98 Acres in Albany project team. They plan to digitally reconstruct and repopulate the South Mall area. You can follow the project on Facebook, and check out their blog. I used to live on jay st #41 I believe because I was 5 when we were moved to pine hills. I so love this site. Brings back so many good memories. I used to live at 7 Chestnut Street (approx where the Legislative Office bldg is now) and I attended School #2. I'm glad this entire area is not being forgotten. Thank you for doing this! The highway interchange is not only an eye sore but an economic "millstone" round the neck of the city and state of new york. I'd love to know the cost of the work now being done compares to the cost of building the interchange. whenever I happened upon WMHT playing "The Neighborhood that Disappeared" (they seemed to be playing it regularly during fund drives) I simply could not change the channel. It is a compelling and heartbreaking history. I grew up in the mall area-the Italian area. Saturday farmer's market for fresh veggies,live chicken to be Sunday dinner. One store sold only bananas. Rudnick's sold school gym uniforms, men's work clothes. Some families pressed wine grapes in the cellar- Chianti. School #8 & Anthony's both walked to-no school bus! NO fear to walk, play, be in the neighborhood. Rules: you break it you bought it --- So don't touch! The Mall expansion digging & ground shaking pile drivers pounded steel foundations day & night. This caused us to move 3 times -finally to Arbor Hill & new school & friends: old ones lost.